I was beyond excited to get my hands on a copy of Flat Out Celeste by Jessica Park! Having previously read Flat-Out Love and Flat-Out Matt my gut just knew this next one would be amazing. After all, this is Jessica Park people! I'm not sure she is even capable of writing bad stories. But, holy cow what I didn't expect was to fall so completely in love with this book! Celeste first captured my heart in FOL and again in FOM, but in FOC she grabbed it and ran from page 1! Honestly, and I do promise I am not exaggerating, Celeste is such an amazing character I found myself sad when the book ended because I didn't want my time with her to be over. I desperately wanted to see her progression through college. She's one of those characters I don't think I would ever get tired of reading about. When I think of Celeste, I imagine the personality of Amy Farrah Fowler on the Big Bang Theory trapped in Penny's body. She has all the brains and intellect but also the looks. The catch? She has no clue how to be a social person and all social interaction makes her completely uncomfortable. Even before beginning this book my hopes for her were to find a sense of social self-confidence, to find a group of friends who would accept her quirks and all, and most importantly I hoped she would learn the balance and importance of having friends in your life. As the story begins we find Celeste eager to graduate from high school and move on to higher education, where she just knows she will find acceptance among other intellectuals. She is tired of the looks, whispers and snide remarks her peers constantly throw her way. So she holds fast to the hope college holds and continues to put her energy towards choosing a perfect Ivy League school. So, what happens when Celeste realizes the college experience isn't all academics, but will also be equally filled with unavoidable social situations? She's always known she would accept entrance into an Ivy League school, but she cannot seem to get excited about any of them and she cannot seem to figure out why. Celeste's life is changing, she suddenly finds herself in uncharted territory and dealing with emotions she doesn't fully understand. Will Celeste come into her own or will she be forever uncomfortable in her own skin? Justin, a sophomore student liaison from Barton College with a few quirks of his own, begins emailing Celeste with the hopes of wooing her to consider Barton College. Several email exchanges and a couple of chance meetings later, it's more than obvious these two would not only make a great couple, but they also seem to bring out the best in one another. Justin quickly falls for Celeste finding she is able to bring a calm and peacefulness to his life like no other. Celeste on the other hand finds a new sense of joy and happiness in this relationship, being able to find someone who appreciates all she has to offer, who isn't intimidated by her intellect and who gets her sense of humor. Justin impacts Celeste's life and slowly we see our girl changing, growing up, opening herself up to the possibility of other new friendships. Speaking of friendships I absolutely treasured watching Celeste test the waters of friendship with Dallas. From their initial meeting to the eventual building of their relationship I enjoyed seeing Celeste work through the doubts in her mind of the motivations behind Dallas' actions and words to the eventual trust in her as a friend. It was simply beautiful. I think it also illustrated nicely the war waging in Celeste's mind on a daily basis. Celeste may be brilliant, but she fights battles within herself just like the rest of us and Jessica Park captures the essence of this perfectly. I know I keep going on an on about Celeste but she is an incredibly genuine character, who has completely come to life for me. She with a huge heart she puts others before herself, she is witty and funny, compassionate and timid, motivated yet almost paralyzed at the same time. And Justin, my goodness this boy is just all around perfect, especially for Celeste. He too has a huge heart, he's confident and patient with Celeste in a way no one has been before. He knows how and when to push, but most importantly he knows when to refrain. He's sweet, romantic and just all around adorable. His character has been written in a way which makes it impossible not to fall in love. 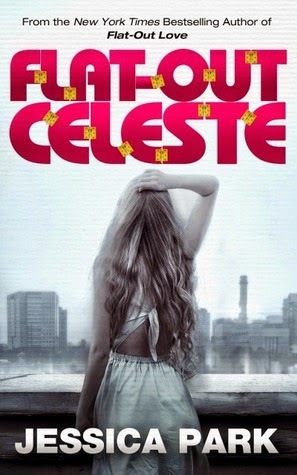 In my opinion Flat-Out Celeste is without a doubt a must read, the kind of book you move right up to the very top of your TBR list. It's a brilliant piece of work and you will not regret making time to read this one. This story is simply amazing. Jessica Park has truly breathed heart and soul into every single one of the characters in this story and once you start, you absolutely will not be able to put it down. Yes, Flat-Out Celeste can be read as a stand-alone, but I think your experience will be further enriched if you read Flat-Out Love first. But, that's just my opinion! Whatever you decide, just make sure the decision is yes to Flat-Out Celeste!